In tonight’s episode, Blake said, “I’m waiting on something unique the can come back and win this thing.” His team was up for the first battle of the night. It was a battle of two power-house divas! Adviser from the band “Coldplay”, Chris Martin was on tap again to give his advice to the artists and their coaches on all four teams. Blake said he put Biff and Sisaundra together because he only has room on his team for one powerhouse R&B singer! Biff said “if you want to be the best, you have to battle the best.” Blake stole Biff from Team Usher. Sisaundra, who is a single mother, said “I’m here because my kids told me to go do it.” Biff was impressed by Sisaundra’s voice, “She’s just like a nuclear bomb when she’s going off screaming.” Blake said Sisaundra looks like a diva and Biff looks like a stud. Martin told Sisaundra, “when you’re that good you have to let people know that you are connecting with them.” He told Sisaundra to look at her audience. “Sisaundra is a bit too good. There’s only a few people on Earth that can sing that good,” said Martin. Adam was the only one who could steal, he said, “I didn’t press my button because I’ve already taken Delvin” who he thinks is similar to Biff. Not Dreaming of Harry Styles! “I was excited because we both have soft voices and similar tones” said Deja about her pairing with Ddendyl. Adam was amazed by their performance, and reminisced, “the first time we ever heard this song was when they did it on the show and it became a massive hit. It’s come full circle. It makes me really proud of being on this show. I can’t imagine two more different singers . Ddendyl doesn’t have much of a bravado, but stayed on key.” He said he loved the richness of Deja’s voice for her being so young. “Both of you did really great. But, you’re right Adam, who do you chose to invest in? Because they are so different from each other. Deja, I would pick you,” said Usher. One battle that wasn’t shown on this episode was from Team Shakira. It’s the second time the show has decided to clip Kristen Merlin’s battle performance. After the battle, coach Shakira said, “Even though Emily has this crazy register and can hit those high notes, Kristen has this unique tone to her voice. She chose Kristen as the winner. Usher paired Stevie Jo and Morgan Wallen for Battles Round 2. He told them, “I wanted my pairing to be fair and I wanted two voices that would compel either of you to be great and to be stolen.” Stevie Jo said he comes from a heavy metal background and winning the last battle gave him a lot of confidence. Usher said Stevie Jo killed that song and took ownership of it. “Its what will bring you through the next battle and hopefully to the end,” Usher told Stevie Jo. Morgan’s day job is a landscaper and never had a voice lesson. He said to win that first battle knowing he didn’t do his best was very reassuring. Usher told Morgan that his last battle was “all over the map” but his confidence is what won him over. They chose to select “Story of My Life” song by One Direction to perform for their battle. Blake told Morgan, “I’m impressed at how far you’ve come and did some things that I didn’t know you were capable of. Stevie, your technique I love it. You never miss!” Blake said he considered the battle “evenly matched” and he thought Stevie won. Usher was very surprised by Morgan’s falsetto. Morgan was also surprised, telling Usher, “I just found out.” Adam yelled, “good timing.” Usher continued, “What that shows me is that you’re a student and you understand that you have to do that work and you did. Stevie Jo, you showed everyone here that you have a soulful essence. Man, what a talent!” Usher picked Stevie Jo as the winner. Usher said he didn’t keep Morgan because he “is still finding out a lot of things about his voice. He hasn’t unlocked his full potential.” But, that worked for Adam who stole Morgan for his last steal. Adam called Morgan over at the end and pushed his button to add him to his team. Morgan said he was thankful that Adam hit his button. His mom was incredibly ecstatic to meet Usher. When the Battles Round 2 are done next week, the coaches of “The Voice” will have their Top 20 artists! 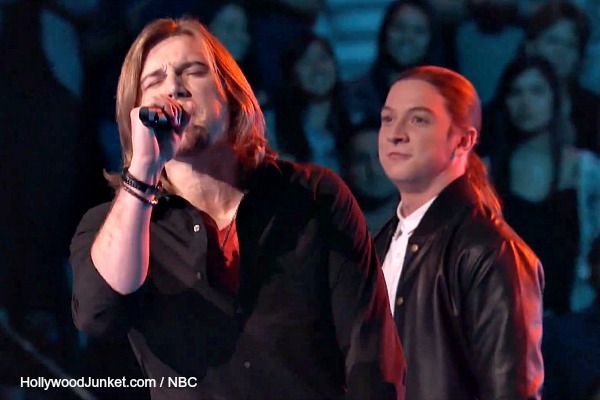 Watch THE VOICE season 6 episode 15 “The Battles, Round 2, Part 2” first aired by NBC on Tuesday, April 1, 2014. This full episode is now available at HOLLYWOOD JUNKET until 06/19/14 courtesy of NBC. ENJOY!